For years I have been wondering about the origin of the foam you can often find on the beach during the summer. I already figured out it had nothing to do with soap. It's supposed to be caused by the decaying remains of microscopic organisms in the sea. As a microscopist, I immediately became curious as to what kind of micro-organisms. Every spring the ocean has sudden bursts of life. In the North Sea, my nearest source for marine plankton, the phytoplankton bloom starts at the end of March. After a couple of weeks tiny algae like diatoms occur in such numbers that the water becomes yellow-brown. Although diatoms are the most obvious part of the phytoplankton, (since they are such spectacular subjects for the microscopist it is impossible to neglect them), there are some other microscopic life forms that add to their numbers. One such creature is Phaeocystis. Most of my microscopy friends find this organism extremely annoying since they form such large colonies that they clog up plankton nets. 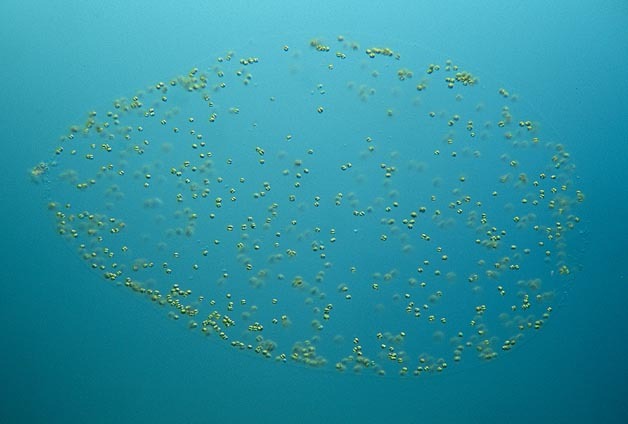 This spring a large part of the phytoplankton bloom consisted of Phaeocystis. After the annual plankton catching excursion of our Dutch Microscopy club, I thought it would be nice to make a picture of Phaeocystis and see if I could find more information about it. The only thing I knew was its name since it was mentioned so many times, in combination with a good deal of curses. But a name is always a good start for a search for information. I thought I might find something in a very useful book called 'Algae, an introduction to phycology'. It contains an enormous amount of information and indeed there was enough information about Phaeocystis. To my surprise, Phaeocystis happened to be the cause of the foam on the sea shore. 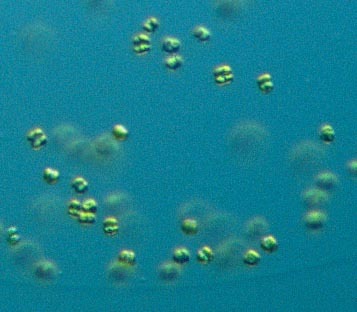 The species involved is Phaeocystis pouchetti, it belongs to the Haptophyta, a group of small single-celled algae. Despite their small size, Haptophytes play an important part in marine ecology since many species can be found in astronomical numbers. Most Haptophytes are flagellated unicellular creatures between 2 and 20 microns in size. In one of my earlier articles I wrote about how these small creatures were discovered by examining the feeding device of the larvacean Oikopleura. Phaeocystis starts its life as a small flagellated cell. Later it will form large globular colonies. The cells are held together by a gelatinous mass in which the individual cells are embedded. The foam on the sea shore is eventually formed by the wind that sweeps up the decaying remains of the colonies. It's a relief that the foam is not some sort accumulation of soap from millions of dishwashers and bath tubs. 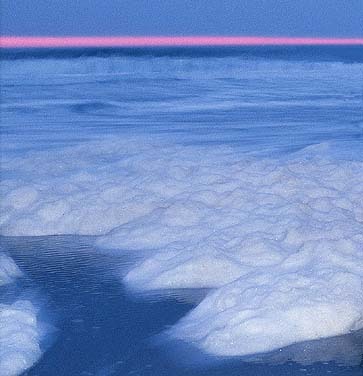 However, there is evidence that pollution does play a role in the story of the foam on the shore. Too many nutrients in the water may cause much larger blooms than would normally exist. This way, extremely tiny creatures can have a great effect, even to the environment. It is already thought that these blooms of algae form a role in global warming. Such events are further described in the Micscape article 'The Cell from Hell'. Several months after this article was published I received a very kind e-mail from the Dutch scientist L. Peperzak, who has done research on Phaeocystis. He informed me that the species I had photographed was Phaeocystis globosa. He also wrote there was actually no scientific proof yet that the foam was caused by Phaeocystis! So there is still a lot to be discovered! Comments to the author Comments to the author sent via our contacts page quoting page url plus : ('wegmond','')">Wim van Egmond are welcomed. Published in the April 2001 edition of Micscape Magazine.